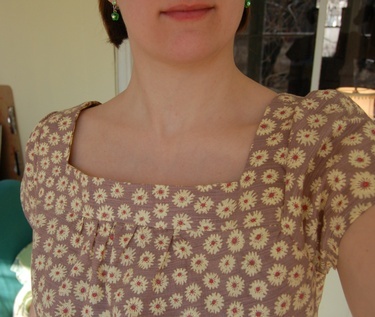 Earlier in the week, I fell in love with a shirt Carol made--such a sweet print, and it screamed "SPRING" to me. She was kind enough to share the pattern info with me (Simplicity 4589 if you're interested), and I ran on over to JoAnn's to get it, along with this fabric (no time to wait for fancy schmancy fabric, I wanted it NOW). 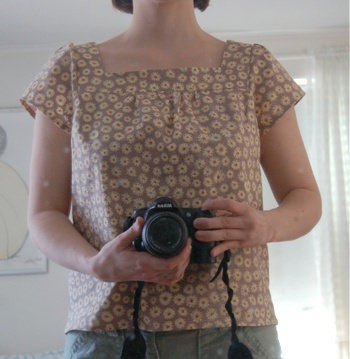 I have to tell you that I've never made a shirt for myself that I've then worn--I either don't finish the project, or it doesn't fit--I either can't even get it on or it's super frumpy. This one might just be the first that I wear. Still not convinced that I love it (feels a bit boxy), but I do like it. And it was such fun to whip up (have I mentioned my silly love of sewing gathers? Four spots to do that on this one little shirt. Wahoo.). And one more for the full effect. Hmn...gotta wash that mirror soon.